The map uses freely available data retrieved Alexa on August 12th, 2013. The company has provided website analytics since 1996. Alexa collects data from millions of Internet users using one of over 25,000 different browser extensions, and the data used for this visualization were calculated “using a combination of the estimated average daily unique visitors to a site and the estimated number of pageviews on that site from users in that country over the past month”. The power of Google on the Internet becomes starkly evident if we also look at the second most visited website in every country. Among the 50 countries that have Facebook listed as the most visited visited website, 36 of them have Google as the second most visited, and the remaining 14 countries list YouTube (currently owned by Google). 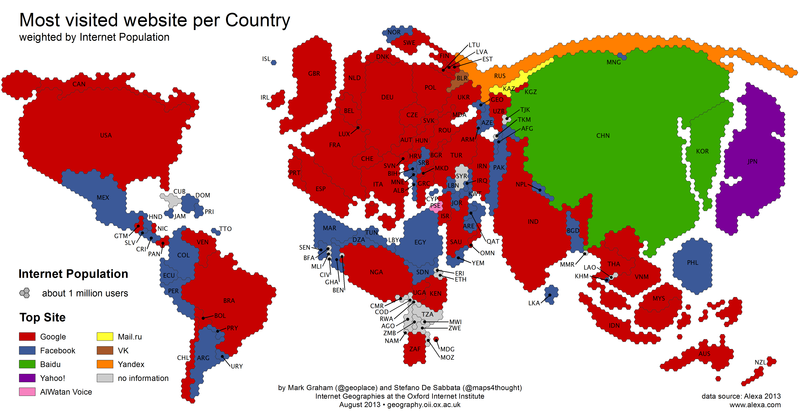 The countries where Google is the most visited website account for half of the entire Internet population, with over one billion people, as illustrated in the map below. Thanks to the large Internet population of China and South Korea, Baidu is second in this rank, as these two countries account for more than half a billion Internet users, whereas the 50 countries where Facebook is the most visited website account for only about 280 million users, placing the social network website in third position.